Jewish World War II veterans receive homage during International Holocaust Remembrance Day ceremony. As part of International Holocaust Remembrance Day, Jewish World War II veterans were awarded with medals and certificates in recognition for their efforts in the war. While more Jewish soldiers fought in the Allied armies than in the Russian army, the long-overlooked American Jewish WWII veterans finally received homage last year at the 70th anniversary ceremony held in Israel’s Armored Corps' Memorial Site – the Yad Lashiryon Memorial at Latrun. However, since many of the veterans are over the age of ninety, they were unable to attend the ceremony in Israel. 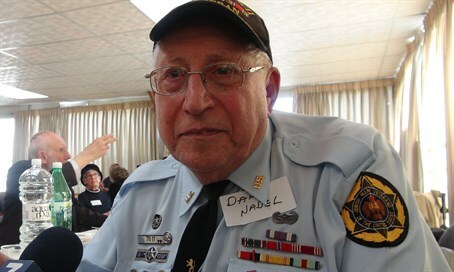 Ninety-five-year-old Dan Nadel, past commander of Post 180 of the Jewish war veterans of the United States, spoke to Arutz Sheva at the award ceremony held on Wednesday by the Museum of the Jewish Soldier in World War II. “Today, is a very important day to remember what happened. We who were in WWII saw it first-hand. There is no way to describe the horror,” said Nadel. Although Auschwitz was liberated 71 years ago, there are still Holocaust deniers in various governments including in Europe. “There will always be people who will deny it because they are anti-Semitic,” said Nadel, “They are born with it, they are made (that way) by their parents."